The Red House is an architect-designed straw bale home set on five acres of jarrah and mari forest mid-way between Margaret River town and the beaches, and just a ten minute walk from the river and the main waterfall. Strawbale houses have super-thick walls making them super-insulated. This keeps the Red House warmer in winter and cooler in summer than standard homes. Strawbale walls also give you a sense of tranquility and peace not matched by conventional houses. Finished to the highest level, this is one of the most eco-friendly and popular holiday homes in the district. The huge open-plan living room has two sets of four-metre wide cafe-style bi-fold doors opening out to the north-facing gardens and the forest. Relax inside and watch the blue wrens, the black cockatoos, the parrots and the kangaroos in the garden. The open-plan living room features a big LED TV with DVD player, surround sound and hi-fi. Every Foxtel channel and all of the terrestrial channels are available. There's also a PS2 with Singstar if you like karaoke! The solid jarrah dining table is three-metres long and seats 10 people in comfort. The second living area has a huge wood burning stove set against a granite wall. The wood burning stove with abundant firewood will ensure your warmth and cosiness whatever the weather! Bedrooms are luxuriously appointed and all have big timber French doors that look out to the gardens. The beds are all hand-crafted from jarrah or tuart with top-class linen. The main bedroom has a king-size bed, the next two bedrooms have queen-size beds, and the fourth bedroom, in the tower, has a pair of king-size singles. The main bathroom has a hydro-therapy spa bath with two pumps and 26 jets. This is a huge room with a big window looking out over the forest. The gourmet kitchen has an Ilve six-burner range, dishwasher, microwave, fridge-freezer and solid jarrah bench tops as well all the kitchen utensils you'll need. We also provide herbs and spices, glad wrap and alfoil. All you need to bring is food and drink! Kids will love the tower bedroom with its stalactite-style lampshades and cosy feel. There is a table tennis table with bats and balls in the separate outbuilding. Broadband wifi with range extenders allow you to access the internet from any room in this very big house. There's a 5kW solar system on the roof of the garage ensuring that almost all of the electricity used at the Red House is provided by the sun. This is a spectacular home in a gorgeous forest location close to everything. It's what "down south" is all about. The red House is NOT AVAILABLE FOR SCHOOL LEAVERS so please do not apply as no exceptions are made. Mountain biking has become very popular in Margaret River and the Red House is very close to the South Carters trails as well as the Pines, the most famous of Margaret River's mountain bike areas. A five-minute ride from the Red House will take you to the western side of the South Carters trails. Margaret River is one of the world's great surf spots with one of the pro circuit competitions taking place here each year. Kite surfing and wind surfing are just as popular in Margs. The wineries and breweries are world-class and Margs is filled with restaurants and cafes. For families, there's a huge range of things to do - from swimming and snorkelling at the local beaches to walks in the forest and visits to wildlife parks and mazes. Horse riding, whale-watching, caving, rock-climbing and abseiling or climbing the Leeuwin Lighthouse. There's lots to do! 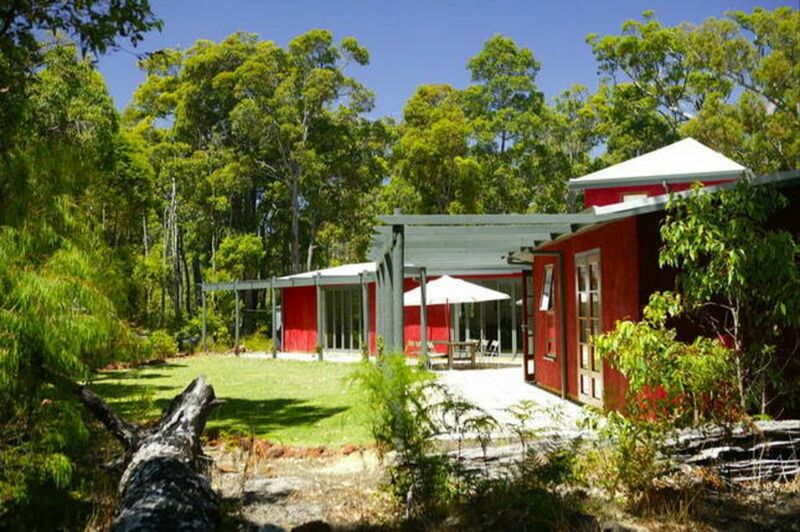 The Red House is set in a jarrah and red gum forest filled with wildflowers and grass trees. It's just ten minutes walk to the river and it's mid-way between Margaret River town and the main beaches (a ten-minute drive each way). You reach the house via a 200metre long driveway winding through the forest. You can walk down to one of the nicest stretches of the river or cycle to Margaret River town or Cowaramup via the rails-to-trails paths that criss-cross the district. You're in the heart of the Maragret River wine region and whichever way you turn there's a winery waiting to be explored. Swimming and surf beaches are within a short drive and the cafes, hotels and restaurants of the region are within easy driving or cycling distance. This is a lovely home in beautiful surroundings. Very well equipped with plenty of seating both indoors and outdoors for larger parties. Close enough to Margaret River, Caves Road, the beach and all the wineries to make it a perfect location. One observation, the upstairs bedroom with the two single beds is not suitable for very young children, (ours were 3 years and 17 months), steep stairs and open bannisters would be a hazard. Just a small point. The kids loved the kangaroos that visited the garden each day. Great home for couples holidaying together. Beautiful,comfortable home. Great amount of space, plenty of privacy but wonderful ‘together’ spaces- big kitchen, lounge and room for all in front of the fireplace. Nature at your door, trees, birds and kangaroos. We loved every minute. Big Thankyou to Ron, for maintaining such a lovely property! Would highly recommend to everyone thentable tennis and darts were winners! The best of town and country! We loved our time at this very beautiful, comfortable and peaceful house. The kitchen is well equipped, the living space large and open and the spa bathroom is amazing. We loved breakfast on the patio looking out into the bush listening to the birdsong. We found that when we went inside the kangaroos came to graze around the house. The location was perfect for us, close to Margaret River but quiet and lovely, the best of town and country. I made the reservation for myself and three friends and they all kept praising me for my brilliance at finding the ideal house. Lovely stay. Has everything you need. Lots of space. Just needs a better shower head. The house has everything you need. Foxtel, kitchen supplies, washing machine and dryer. My bed was comfortable. We had 4 couples in the house and there was plenty of room. Only thing that would be nice is a better shower head. Apart from that it was a lovely stay! My family of six, including my 95 year old father-in-law, enjoyed the most beautiful and relaxed Christmas at The Red House. Located between the township of Margaret River and Gnarabup beach - it’s a perfect place to stay. We only stayed 5 nights and this was not long enough as there is just so much to see and do in the area! The home itself was beautiful and spacious with everything you would ever need. The oven (bigger than my own) was able to handle the cooking of our Christmas lunch and the kitchen was extremely well equipped. A big hit was the family of kangaroos which would graze in the backyard each dawn and dusk. We were even greeted by a huge grey kangaroo on the driveway one evening! The house was lovely & cool in the heat of summer. Each day we did trips around the region, including: swimming at Gnarabup beach, visiting Mammoth Caves, Cape Leeuwin lighthouse, the sting rays at Hamelin Bay, Busselton’s 1.8km pier, Leeuwin Estate / Vasse Felix / Evans & Tate wineries, swimming in the crystal clear waters at Eagle Bay.....a photographer’s paradise, oh, and no crowds!! Thank you Ron for sharing your beautiful and welcoming house. We would definitely love to make the trip again from Sydney.